I got to deliver a letter from Kust but he stays in his house all day sleeping with the door locked (possible hikikomori). Also after saving Valdr, he returns to Falkreath and starts massacring all the farm animals (goats, the oxen, etc), hes a madman. LOL, well, I'll look into Kust because he's not supposed to do that at all. He should be out tending the graveyard for most of the day like usual. 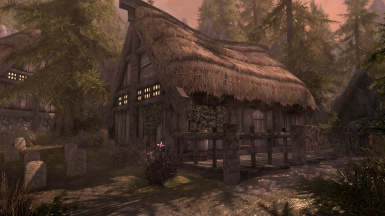 No idea why Valdr would do that since I have not changed any of his faction affiliations and he shouldn't have it in for the livestock and never has when he's come to spend his life at the inn. I don't know if this is related but when I meet Valdr, I of course receive the quest to heal him. But this time I didn't have any potions or healing spell so I went into the Moss Mother cavern, killed the spriggans and when I came out Valdr was dead of course, but the quest to Heal Valdr's injuries has never left my quest log even tho he is dead. I think this is a bug more related to just Skyrim itself. Healing Valdr gives the normal quest completion results, but like I said earlier - he returns back to Falkreath, and he takes out his bow and starts going on a rampage killing all of the livestock while yelling. 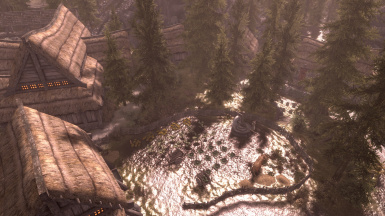 The other citizens of Falkreath are too scared to do anything so they just idly standby while Valdr plays CSGO with the towns livestock. I use all your town expansions. Did one new start in Falkreath. Starts to look after one axe for getting some wood. But no one was to be found. Have you cleaned them out? I haven't done anything to the existing stuff in the town. Only added mine to it. Hmm. Then I need check if there some other mod that removes them. Compatible with The Great City of Falkreath? Hello, great mods! Thanks for your immense contribution to the community! I use almost all your mods. I have a question: Are you planning to release an all in one pack for SSE? He has answered this many times. There are no plans at this time as all mods are still considered active. The reason he did it on LE was because he was totally finished from updating all his LE content. Thanks, I have scrolled trough some pages, but did not find the answer, even if he answered it many times, how could I know? Thanks for the answer anyway, good to know. Never had any plans to do anything like that but it could be a nice idea. In the case of those 2 brothers they'd end up as Stormcloak soldiers. If you ever took the time to follow them to where their AI sends them, they make it all the way to Winhelm assuming wildlife doesn't kill them first. Have you seen BUVARP SE - Barely Used Vanilla Actors Recycle Project for SE? It re-purposes several dozen quest-only characters, including the Grey-Mane brothers. I've seen the BUVARP acronym around but never knew what it was for. Pretty cool, but I'd probably do quite a few things differently with any NPCs I were to take a crack at. Though there's now much less motivation because I don't want to seem like I'm poaching the guy's idea. Arthmoor said he never had any plans to do anything like that, which I misinterpreted as not having any interest in doing that in the future either. I was just hoping to point out an existing mod for people who were looking for something like that, and maybe bring some attention to BUVARP since I feel like it's often overlooked due to its confusing name. Arthmoor, for the record, I don't think that would be poaching. BUVARP is shared with a WML 1.0 Cathedral License, and incorporates the ideas and inspiration of multiple people. "Re-purposing quest-only characters" is a broad concept that could be accomplished in very different ways. I'd love to see what you would do with such characters. Your modding style tends towards content that doesn't even feel like a "mod", but instead feels like what the game could (and should) have been in the first place, if much more time and detail had been put into it. You would incorporate quest-only characters into the world in a much different way than someone else would. We'd all love to see your ideas. BUVARP author here. I don't mind if you take some ideas from BUVARP. In fact, if it can inspire anyone to adress more NPCs like that, I'm all for it. Nice mod man. But i have an question, Is it compatible with immersive citizens ai overhaul? As with all village mods, it is as long as you make sure they load AFTER IC, not before like the author of IC insists. His navmeshes only take vanilla layouts into consideration. 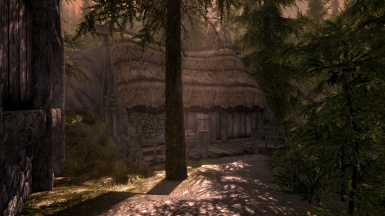 Falkreath, my 2nd favorite town. Just a small question. Is this compatible with Helgen Reborn? Very compatible. No navmesh conflicts or clipping with Reinhardt's house. ooh dang it wouldnt be that smart installing this on my exsisting save right? I did. No problems. From what i believe, Arthmoor's expension mods are save to install midgameplay. Try it. Do not save before check Falkreath. When it's good, you are fine..
Hi Arthmoor.. Any plans on an expansion for Morthal and Winterhold? Would be great..